In 2020 the most famous combat ship of the Russian fleet – "Aurora" will celebrate its anniversary. The fate of this cruiser is the fate of the whole Russian history of the last two centuries. The cruiser the Aurora was bounded on 23-th of May, 1897, floated off on 11-th of May, 1900. It became a part of a fleet on 16-th of June, 1903, and conducted its first combat already on 2-th of October, 1904. And the last combat was conducted by the cruiser in August, 1943. It is an interesting fact that the cruiser "Aurora" received its name in heroic inheritance in the name of not less legendary wind-driven frigate that distinguish itself at hardening of the east boundaries of Russia (Petropavlovsk-Kamchatsky) in the middle of 19 century, protecting the city from a squadron of the Anglo-French military forces in 1854. The wooden wind-driven frigate, for the first bearing the name "Aurora", was constructed in 1835 on the St. Petersburg's shipbuilding yard. The ship was less than 50 meters in length and had only 58 main guns. First "Aurora" was brawling only 26 years. The fabulous combat for frigate was a combat in the Avacha Bay when the frigate was the main defense of Petropavlovsk. The Russian seamen forced enemies to leave the water area, having lost in battle 450 killed and injured soldiers and having suffered, in turn, casualty in number 32 dead and 64 injured. After the lost Crimean war in 1857, the decision is made to construct new ships which have to answer the "spirit of times" on power, equipment and other maintenance factors. Sailing ships have to be replaced by the ships of new steam type having the screw or wheeled mover. The steel foundry is building on a new enterprise under the capital in Aleksandrovskyi village on the initiative of the director of the mountain plant «Zlatoust" M.P.Obuhov where the method of steel production invented by the Obuhov too is implemented. The appearance of the cruiser "Aurora" as a modern fighting entity of the Russian fleet was bound to these actions and decisions of the government. Design features of this ship nominated "Aurora" to the advanced positions among the European steam and armored analogs. "Aurora" also forged due to its artillery equipment. Arsenal of the cruiser demonstrated the best engagement range, good parameters of its ballistics, armor-penetrating ability, and rapidity of fire. By the way, the invention of smokeless gunpowder in which the Russian chemist D.I. Mendeleyev took part provides strong support to these indicators. Thanks to this gunpowder the rapid application of optical means of targeting and managerial improvement of fire control systems began. 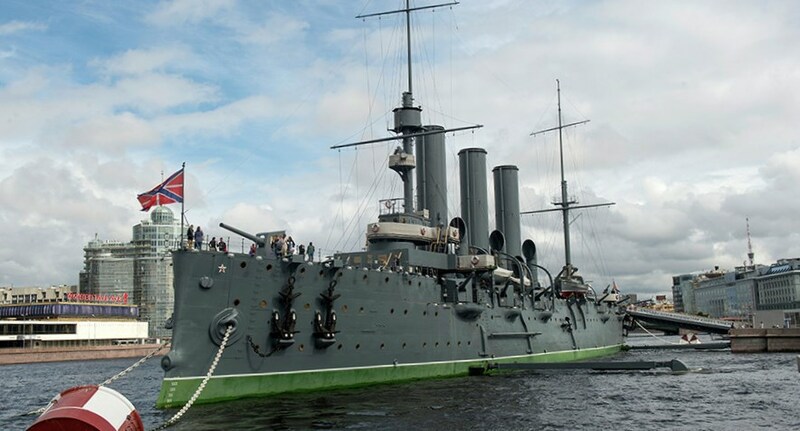 Moreover the cruiser "Aurora" became the first fighting ship equipped with the devices of a domestic radio communication (at the end of the 19th century the Russian scientist Popov invented distortion-adaptive receiver) and also the first ship having the steam dynamo cars, i.e. electric drives. It just happened that the cruiser "Aurora" finished itself a stage of creation of the Russian steam armored shipbuilding of a turn of the centuries. In October, 1904 the cruiser composed the 2nd Pacific squadron and starts on a cruise to the Far East. During the movement of the ships the news of Port Arthur's overthrow comes, and the squadron receives a break task to Vladivostok and ensuring of our fleet's supremacy in the Sea of Japan. On 14-th of May 1905 "Aurora" as a part of a squadron enters Korea Bay where the known Battle of Tsushima where the Russian fleet got the knock took place. "Aurora" together with the cruiser "Oleg" faced an attack, protecting transport ships, having received 21 corps-dedicated hit in that combat. In April, 1906 "Aurora" comes back home and gets under repair in Kronstadt after which the ship will be converted in an educational ship for midshipmen. In 1907-1908 there is an arrangement of educational campaigns. In 1909-1912 "Aurora" makes two large companies across the World Ocean, having passed 25,5 thousand miles for the first time and 26,2 thousand miles for the second. 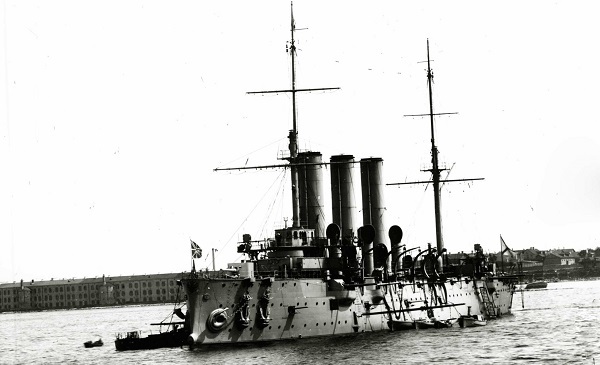 In July, 1914 the cruiser "Aurora" enters into the 2nd crew of the Baltic Fleet and is engaged in a successful patrol, investigation and protection in the Gulf of Finland. 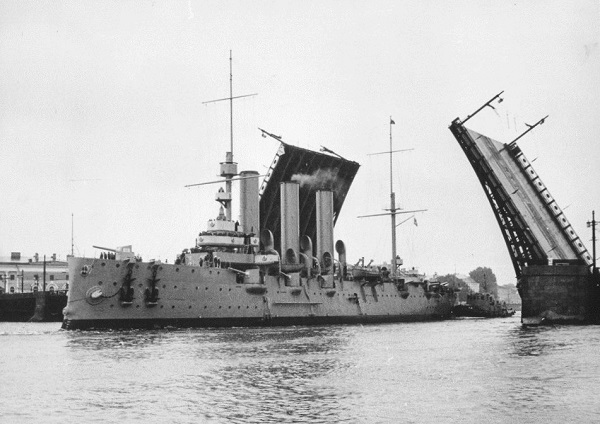 Fighting watch of the cruiser is replaced by repairs, war events again, until 1917 fatal for Russia. The underground already operated on "Aurora» by that time, in Februarythere was a revolt in the ship therefore the cruiser became a powerful support of revolution. 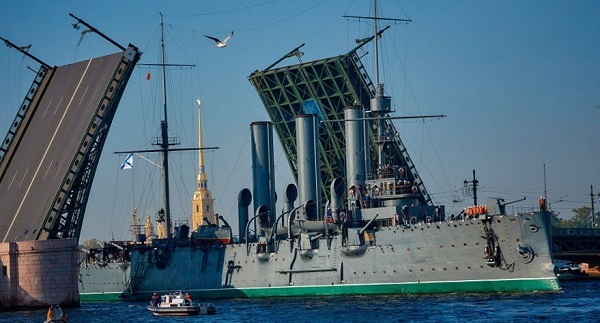 On 24-25-th October "Aurora" moved to Nikolayevsky Bridge under a red flag, showing the impressive support of the Bolsheviks. The shot from the cruiser was blank, for a long time it was considered that it served as the sign of the beginning of the combat assault of Zimnij. Later sailors sent a "refutation" to the newspaper - their shot was just "coordinating" for other ships of Baltic Fleet that also arrived to the city. During the civil war the new Soviet power was protected by "avrorovcy" ("Aurora's" soldiers) and weapons from the ship on different fronts, and after the victory the cruiser becomes educational again. In the mid-twenties several foreign campaigns under the flag of the new state also accrue to the cruiser. During the Great Patriotic War they remove all basic artillery again and ride it at the front line, and on its board there are only 21 persons. So, almost unarmed "Aurora" with a small team protects the sea way to Oranienbaum, and the crew's seamen beat off the overland Nazism’s attacks at the Luga boundary, near Duderhof, on the Voron'ya mountain. "Aurora" protects Leningrad with the remained weapons. During the air raid in October, 1941 the ship cought serious damages, it begins to heel. Sailors open opposite valves and level the cruiser. But it sits down. So, in the semi-flooded provision "Aurora" continues to beat off enemy bombings to the very lifting the blockade. In one of such raids the enemy forces down the cruiser's ensign. One of the sailors, risking, hoists it back, demonstrating the crew's courage of motionless, "covered with wounds", but all the same efficient ship. In 1944 the cruiser is lifted, repaired and it begins another life. Life of an educational ship, then museum branch, symbol life, memory life. But at the same time – the operating ship of the Russian Baltic Fleet where the St. Andrew's colors are hoisted every day!